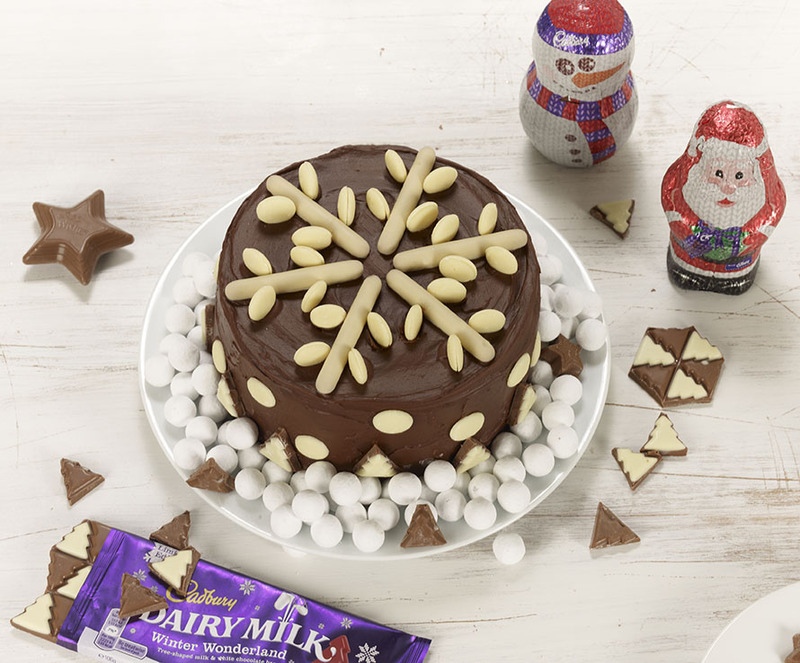 My Snowflake Cadbury cake was created for Cadbury using an assortment of their festive themed chocolates. 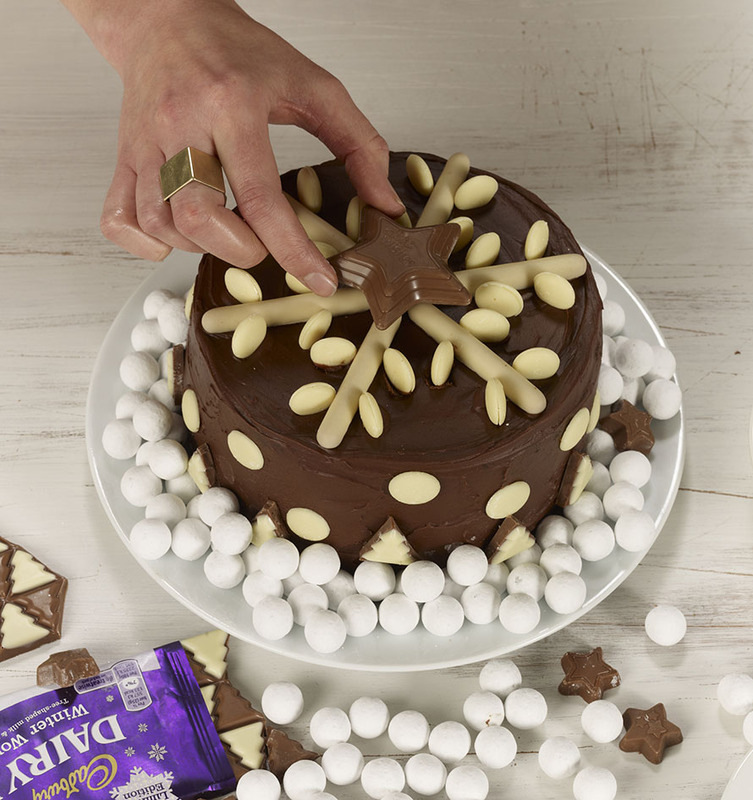 Surrounded by Cadbury snow bites, mini wishes and white chocolate winter wonderland trees and buttons each slice and accompanying treats serves up a snowdrift of chocolate. Cadbury chocolate and ‘a glass and a half of milk’ can even be found within the cake itself. Hidden chocolate snow bites not only add an extra chocolate hit to the centre of the cake but serve up a surprise amid the chocolate ganache filling when the cake is sliced through. The Cadbury white chocolate finger biscuits produce the effect of a snowflake on top of the cake and help portion out the slices when ready to be served! Mini indoor sparklers rather than candles can be inserted and ignited to make the cake even more magical, together with a dusting of icing sugar snow to fully set the scene. Grease and line a deep base 7″/18cm round cake tin or 2 x 7″/18cm round shallow spring form cake tins. Melt the sugar, syrup and butter together in a medium pan over a medium heat, stirring on occasion with a wooden spoon. The cakes should be springy to the touch and a knife pushed into the centre of the cake should come out clean. Don’t worry about any cracks on the surface of the cake as they will be covered by the ganache later. Leave the cakes to cool in tin/s before turning out on to a wire rack to cool fully. Carefully dot and press a handful of chocolate snow bites into to the ganache, as if hidden in the filling. Place the other cake on top and sandwich together gently. To decorate, place the chocolate finger biscuits on the surface of the cake to create a snowflake pattern and then stick in the chocolate buttons sandwiched together to produce the snowflakes tips. Scatter around remaining chocolate snow bites around the base of the cake. Dust with icing sugar for an extra flurry of snow if you wish.